I guess Anythings Possible If You Give It A Go? For the many new independent artists who open a Youtube account, put out their music videos on Youtube covering popular songs, do so for many reasons. 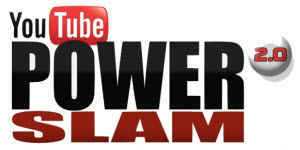 One of the main reasons for doing this, is they hope to attract more views and subscribers to their channel and video. However, a lot soon become disappointed over the results their cover has been in attracting more people to their video and youtube channel. There are lots of factors why this approach is not likely or is not going to work for a lot of them. Outranking other savvy youtube artists who have covered the song is not going to be easy for four main reasons. They have more subscribers then most if they have been around for longer. Those immediate views they get from their massive subscriber list of fans will lift them up in the ranking and keep them there. The continued views they keep getting from their fans keeps them at the top. All that social proof they get from their fans on FB, and Twitter helps to convince Google and Youtube they belong at the top. So for just those reasons above it’s not going to be that easy to get above them and grab some of that Google search traffic, that’s in abundance every day. Some would say it’s impossible to compete and get noticed. However, there are ways you can get some of that Google and Youtube Traffic and get noticed by those searching for those songs that are playing repeatedly in their heads. For the first part let’s understand that the second largest search engine on the web for video is YouTube and getting good placement in youtube’s own search is going to help in also getting good rankings on Google. This is also the reverse, get top rankings on Google, and you are most likely to have your music video of a popular song show up when people are searching on Youtube for the original artist or a cover of their favorite song. For this, we are going to use our lovely Charlotte Black using one of her videos. Charlotte has five videos up on Youtube and 746 subscribers with 123,592 video views to date at the time of writing this case study. “Tuesday 12 Feb 2013” With some work from me on the outside (I don’t have access to Charlotte’s account) and only following Cliff Carrigan’s advice in his YouTube Power Slam I want to see if I can improve her rankings. Let’s see what comes up. I would expect a result using this exact search phrase. As expected I get a result, since I know about Charlotte and know just what I need to type into Google to find her, she is right where she should be, at the top of Google’s first page results. Okay, I found some, Charlotte’s not in the results. However, this tells me the average cover artist with a little SEO knowledge has something to work with. Furthermore, it’s entirely possible that the top spots are taken totally by accident, and the artists don’t have a clue how they managed to be there on top. If that’s the case, then it makes it a lot easier for me to get Charlotte above them or included in Googles results. It’s pretty clear to me that with the right knowledge and a bit of work and brainstorming it’s possible to get found on Google and also Youtube’s own indexed search results. This time Charlotte is – MIA – Missing in Action; I had no illusions that Charlotte would be there, and if I did not already know about Charlotte’s musical talent. I guess it would not make any difference to me since she didn’t even exist in my mind, I would just go on to check out her competition. 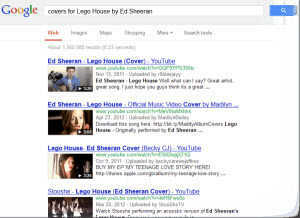 Now let’s do the ultimate search in Google and see what it brings up for Lego House by Ed Sheeran. It will be interesting to see if any musical talented artists have managed to get a placement for their cover version of Ed’s song? I believe none will have done so. Of cause, there are no official statements on this fact from Google, and it may be possible to get your video listed if deemed allowable sometime in the future. Google knows what I’m searching for, and I would expect them to offer up to me the most relevant videos they have indexed, and rightly so that would-be Ed Sheeran. However, what intrigues me the most is, could it possible for a cover artist to get a video placement right now on Google’s first page results in between the original artist listing? Right at this time, no it doesn’t seem possible; however, it’s possible to get better rankings, then Charlotte already has for her video at present that I am sure of. If we go and use Youtube’s own search engine “the second largest on the web” Youtube’s internal search is used primarily for music videos or individual entertainment videos, I’m expecting something totally different. So where do the searches, I used in Google pan out? Let’s see. The first one got Charlotte right at the top, ignore the ad above her listing. 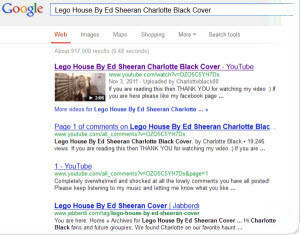 The second search in Youtube for Charlotte using -covers for Lego House by Ed Sheeran- got her MIA again, Sob sob. In my mind, there are no doubts that people can use YouTube, Google, and other main search engines to gain subscribers and genuine new fans to come and view their video and visit their youtube channel. All that is needed is a little SEO love working to give you a lot more targeted search results. And not just for the main topical phrases I used above to get your videos seen by more people searching for a favorite song. However, it will help to have a little inside knowledge on how YouTube search works and how the other major search engines index videos for search. So that’s the main reason what got my attention when I came across Cliff Carrigan’s Youtube video ranking tutorial product. 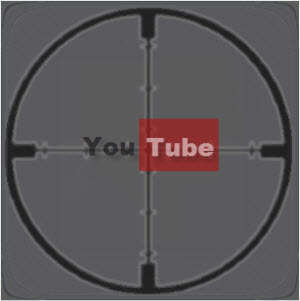 We have already established that there are two different places you can get your videos ranked. First, you can rank in YouTube’s index against the original artist even with a cover song. You can also optimize your actual video page and your YouTube channel page to get remarkable good search placement in Google’s main web search without the mention of your name.